We offer educational activities for young and all. Presentations, hands on activities and workshops on and around the mountain for schools, local community and corporates. 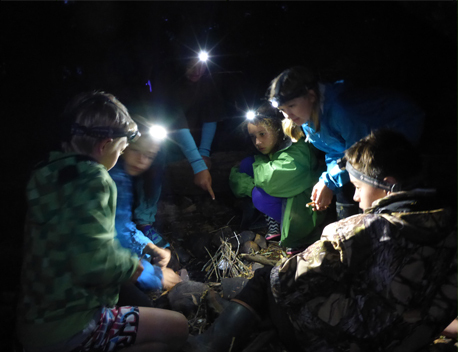 This program provides place-based outdoor experiential learning and leadership opportunities by connecting young people to a variety of ecosystems based around the diverse range of Karioi Maunga (forests, streams, estuaries and coastline). Through a broad range of activities and opportunities that are challenging, physical, conservation focused and fun, we connect kids to their local backyard. This program engages young people in hands-on conservation and environmental science through location-based experiential learning. Activities are based around the diverse ecosystems of Karioi maunga with a focus on water, land and sea. The programme encourages students to explore the natural world and think in terms of inter-relationships and ecological contexts, then apply this learning to local actions for a more sustainable future. Together with Raglan Area School, A Rocha Aotearoa NZ and Papa Taiao Earthcare, we piloted the Manaaki Ao programme in 2017. The program aims to develop NCEA students’ skills in sustainable and ecological actions and enable them to earn NCEA credits through hands-on practical conservation activities. The programme runs for a full school year for year 12 students with a focuses on land-based ecosystems around Karioi Maunga with an emphasis on sustainable action. Subjects include biodiversity restoration, project management, safety in the outdoors, team building and predator ecology. In 2019 we will also be offering a range of Manaaki Ao programs to year 11 and 13 students.